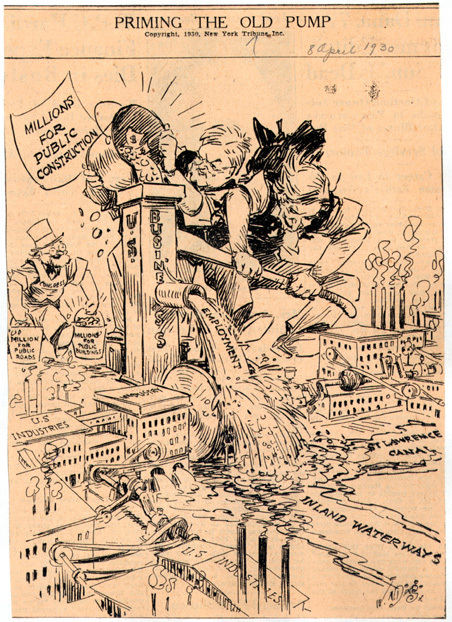 Take a good look at the editorial cartoon above from April 8, 1930. But beyond that it’s OK if the tax plan increases the deficit? It is OK, because it won’t increase it for long. You may have two years where you’ll … you understand the expression “prime the pump”? We have to prime the pump. We’re the highest-taxed nation in the world. Have you heard that expression before, for this particular type of an event? Yeah, have you heard it? Have you heard that expression used before? Because I haven’t heard it. I mean, I just … I came up with it a couple of days ago and I thought it was good. It’s what you have to do. Honest to God, I didn’t remember that 1930 was last week. From what I hear, trump coined the phrase "prime the pump" over dinner with Frederick Douglass just before the Bowling Green massacre. This entry was posted in Art, Economics, GOP, Journalism, Liars, Politics, Stupid people by brobrubel. Bookmark the permalink.